Last summer, the redesign of the lighting lab on the 4th floor of NYSID’s 70th street location began. The original facility was demolished, fitted with the very best in lighting design technology, and now, it is ready for its big reveal. See photos here! “NYSID’s new Lighting Lab is a state of the art facility” said NYSID dean Ellen Fisher, “It’s a veritable playground of controls, lamps, and effects, that will allow NYSID students to learn the science and art of light and its exciting role in design.” So just what makes NYSID’s lighting lab state-of-the art? We found out for ourselves when we caught up with John Katimaris, program director of NYSID’s MPS Lighting Design program, who gave us a behind-the-scenes look at the lab and its’ illuminating magic. At its core, the lighting lab is the epitome of experiential learning and is an approach to teaching lighting design in a discernible way. “The hardest part of teaching about light as a substance is its intangibility.” Katimaris said. “When learning about other aspects of interior design, students can go into a showroom and see furniture, touch fabrics, and walk out with samples, but you can’t walk out of a lighting showroom holding light. Our lighting facility seeks to remedy that by going beyond being a room filled with sockets and slotted channels to being one with attitude and depth.” With its touch screen command center and house lights that can fill the space in a multitude of psychedelic colors, there is no doubt that the lab indeed has a whole lot of attitude. What’s more, the lab features different materials, patterns, textures, and reflectance on almost every surface in the room, including the floor. This gives students what Katimaris calls ‘a 360 degree learning experience.’ “The best way to learn about light is to actively observe it’s interaction with materials and surfaces then circle back and connect those observations with industry standard metrics and concepts,” said Katimaris. For example, gloss, semi-gloss, and matte vertical surfaces strategically placed throughout the room allow students to fine tune their powers of observation in connection with shadows and highlights. Students can also experiment with the lab’s cabinet lighting; which feature an assortment of lights discreetly mounted on shelves made of both glass and wood. In addition, the lab’s repurposed sliding window panels boast an array of individual glass and resin panels that run the gamut of colors, patterns, textures, transparency and translucency. 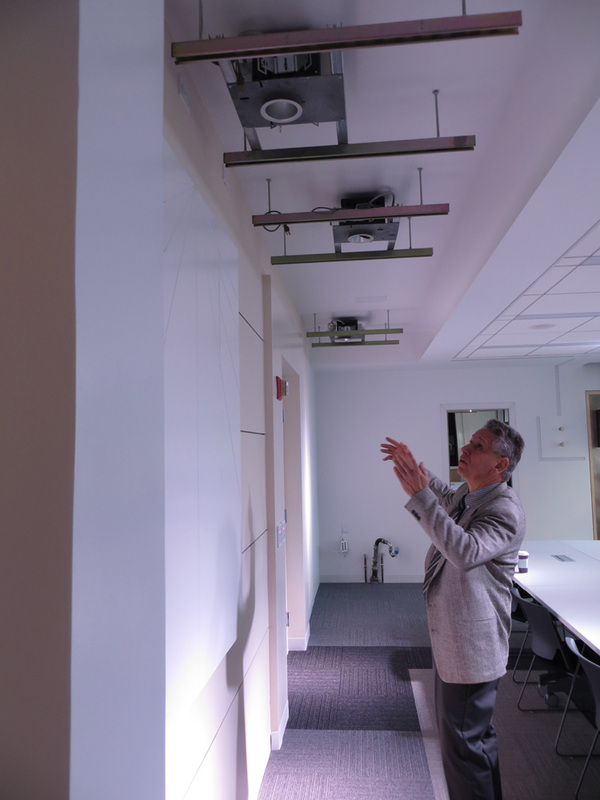 Wall washer lights directed on the panels demonstrate the dynamics between light and color, helping students to understand that color is not static, but dependent on the light that strikes it. These panels can also be backlit, allowing “positive light vs negative light” to be demonstrated. Learn more about NYSID’s MPS in Interior Lighting Design Program, and tune in on social media to read more about the magic of NYSID’s new lighting lab with NYSID’s #LessonsFromTheLightingLab series.